Muse win Best Live band at the Brits! 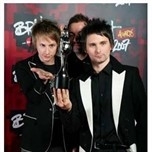 Muse picked up another fantastic Brit award for Best British Live Band last night. The awards were held in Earl's Court, London. Voted for by the fans in association with Radio 2, it is the second time Muse have won this award. Thanks to all those that cast their vote. It is a great honour to have won it.